Mountain biking didn’t exist when I was growing up but, because I lived in a small village and we had to make our own fun, I did a fair bit of off-road cycling across fields and along footpaths. And this was so long ago that cycle paths didn’t exist and people were happy to see kids thrashing about on bikes. Now you need the right bike for the right terrain. We have four bikes in our two-person household and only one of them belongs to me. It’s a road bike and not designed for off-road fun and games. 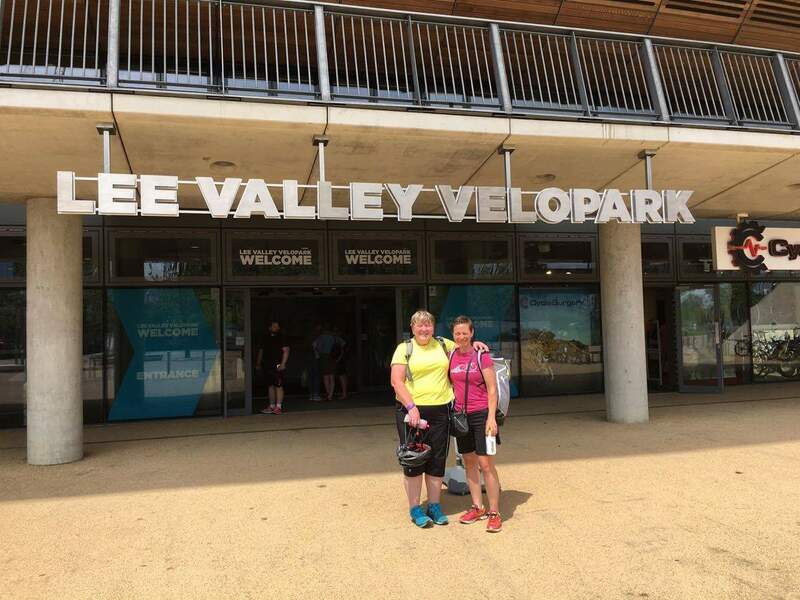 Luckily, Sarah from Cyclists Fighting Cancer came to the rescue and invited me to join her for a jaunt round the mountain bike (or MTB) trails at the Lee Valley VeloPark. With the added bonus of a spin around the velodrome. It would have been rude not to. A few days before we were due to meet, I scoured Total Women’s Cycling, hoping to absorb enough information on MTB to navigate my way around the trails without injury – to body or pride. On the day, walking to the velodrome in Queen Elizabeth Olympic Park, I spotted a few NightriderLondon signs still fluttering from the weekend’s 60km/100km cycle ride around London at night. I felt a bit nostalgic seeing the signs because NightriderLondon was my first Freyathlon event – in June 2015. Excitement levels were high when Sarah and I met, and weren’t daunted by completing a few necessary forms before we headed off for our first costume change. To use the MTB trails at the VeloPark, you have to wear a helmet and gloves and they recommend wearing clothing that covers your arms and legs. 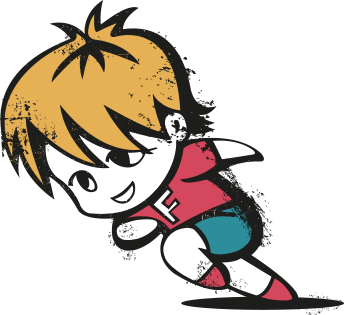 I’d brought two sets of clothing with me – one for the outdoor trails and one for the indoor track session. 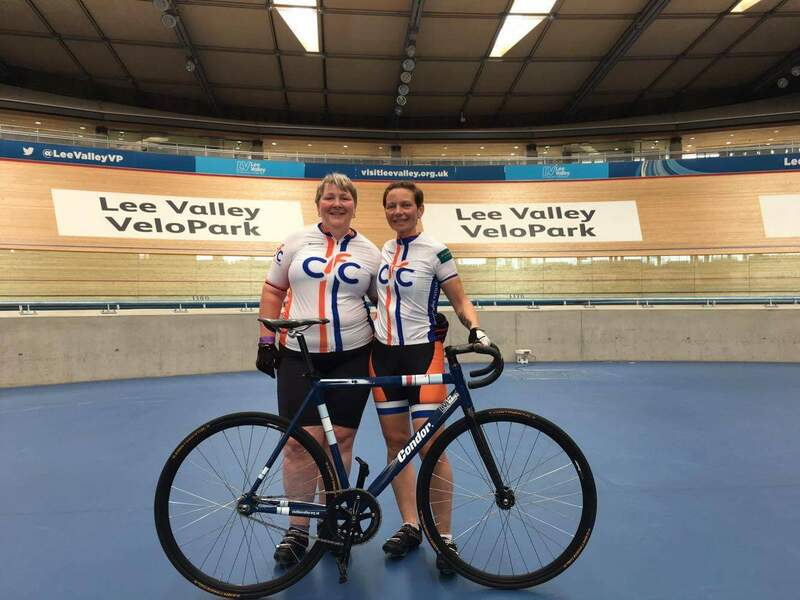 In the changing room Sarah presented me with two gifts from Cyclists Fighting Cancer, a T-shirt and a cycling top – I pulled on the top and hoped no one would notice was short-sleeved. We collected our bikes and adjusted the seat heights. 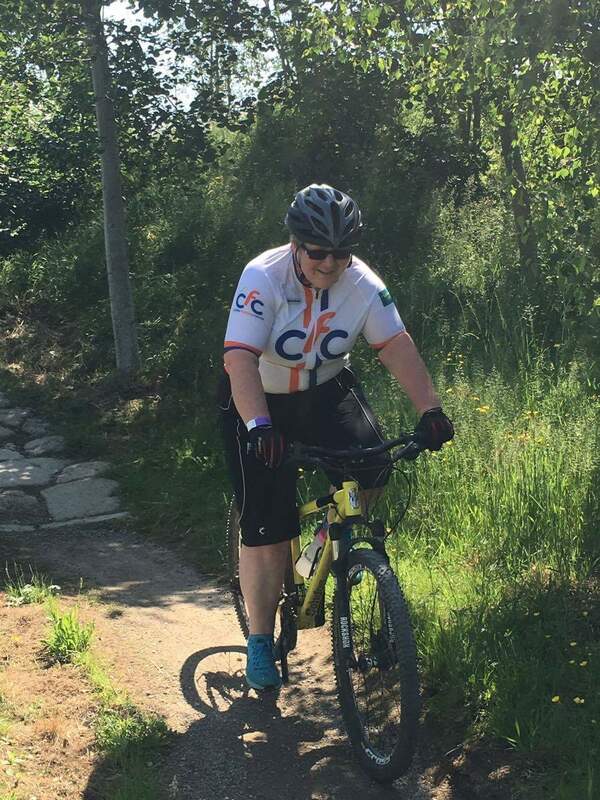 The bikes had soft, squishy tyres and I quickly tested the brakes and gears – I didn’t want to find out how they responded during a descent on the MTB trail. The VeloPark has three MTB trails: blue, red, black. Sarah’s experienced on MTB trails, I’m not. My nerves got the better of me and I asked to start on the entry-level blue single-track trail and see how we – more exactly, I – got on. Sarah set off and I followed cautiously, trying to remember everything I’d read and watched about technique and skill. Because I ride a road bike, I’m used to being clipped in so it felt odd wearing trainers and having more manoeuvrability. The trail twisted and turned, and we made our way over a few humps before Sarah spotted the backdrop of the velodrome and called a halt for a photo opp. Back on the bikes we headed up and down a few slopes, over more humps, weaving our way through the bushes. 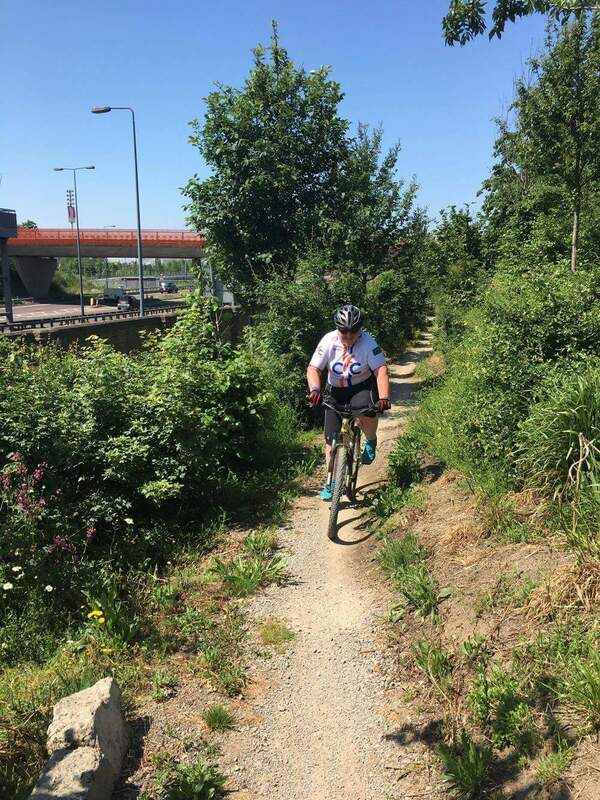 The trail’s been cleverly constructed to give the impression and experience of off-road cycling and at times I almost forgot I was in London – until the sound of the traffic on the nearby A12 cut in. 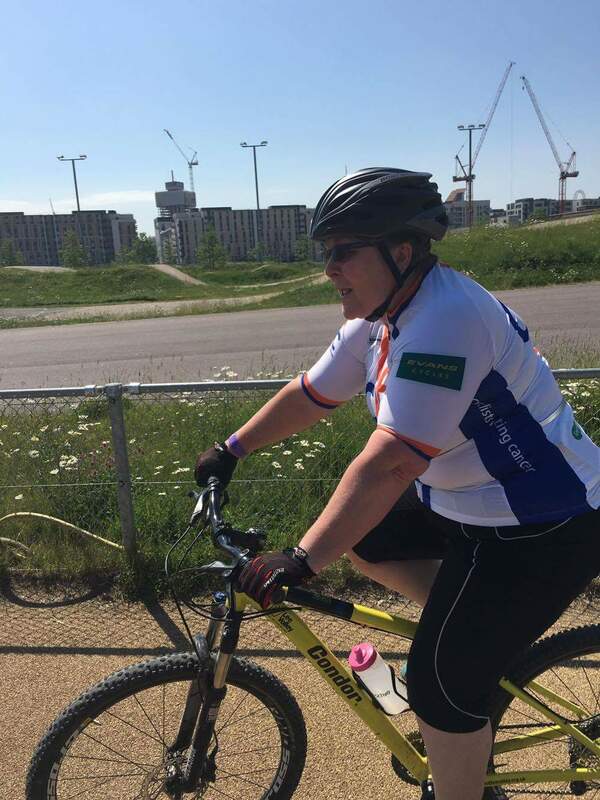 As I gained confidence (in myself and the bike) I started to cycle faster. Which was great for me but not so great for Sarah, who kept trying to get far enough ahead to take photos of me hurtling towards her. The terrain of the trail changes (earth, tarmac, bricks, tree roots, paving slabs, rocks/pebbles) and each element is designed to test your skills. It turned out I was least equipped to deal with the tarmac. We’d finished a loop and were heading back to the start of the trail, all I had to do was turn right and follow Sarah under a bridge. I turned the handlebars and, in the slow motion that all cyclists are familiar with, knew the front wheel was about to hit the kerb and I would fall over. I fell, hitting the kerb, and landed in the undergrowth. Sarah turned round to see me lying in the bushes and laughing. ‘I didn’t even have my camera out!’ she said, as I removed prickles from my cycling shorts. In a bid to distract me from my damaged pride, Sarah asked if I could cycle with no hands. I gave it a go and it was as successful as every other time I’ve tried it. Sarah tried too. The fall from my bike was the first Freyathlon injury I’ve sustained – a cracking crop of bruises on my legs and back. On the second loop of the trail, Sarah suggested we include a bit of the red trail. It wasn’t as tough as I’d expected and I surprised myself by enjoying the challenge, even cycling harder and faster along the sections of the blue trail which were now familiar to me. Another loop and it was time to head back to the velodrome for part two of the day. During the whole time Sarah and I had been on the trails, we’d only seen two or three other cyclists. I made a promise to myself to come back again to tackle the whole of the red trail – and maybe the black trail! They’re pretty strict about being trackside and ready to get on the track bikes 15 minutes before your time slot, so we only had a few minutes to change tops and shoes, and swig some water. Neither mine nor Sarah’s cycling shoes were fitted with the right cleats (worth checking in advance) so, after a bit of shoe-shuffling, we were shod and took our place with the group. 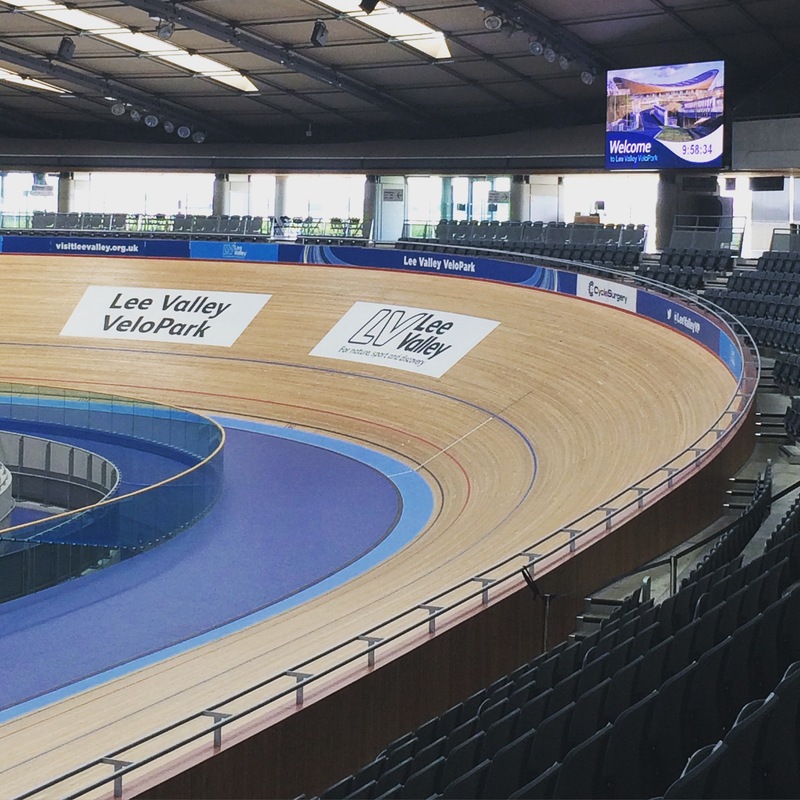 The instructor checked who’d cycled on a velodrome before and explained the principles of track cycling: no gears, no brakes, keep pedalling. After a few turns along the safety strip, we moved onto the blue strip (the Cote d’Azur, the instructor told us) and practiced keeping pace with each other. I’d started at the front of the pack with Sarah and slowly slipped further behind. The instructor urged me to cycle faster and harder to keep up with the cyclist in front of me but sprinting has never been my strength. He called us back to the rail and explained how to overtake, and how to allow yourself to be overtaken. He told us to move up the track and if he thought we were doing OK he’d tell us to move up higher up the track. We practiced. Sarah sped past me a few times. The instructor told me I’d need to cycle faster if I wanted to reach the red line. I cycled faster and managed to reach it before my legs started to tell me they’d had enough. We hurtled around the track, passing and being passed, for the last few minutes before the instructor called us all to the rail. During the debrief at the end of the session, someone asked how fast we’d been cycling and the instructor said some of us (not me!) had probably been cycling each lap in about 35 seconds. Which sounded impressive. Then he told us Bradley Wiggins had cycled each lap of the track in 17 seconds when he’d completed The Hour. We looked at each other and at the track. History. 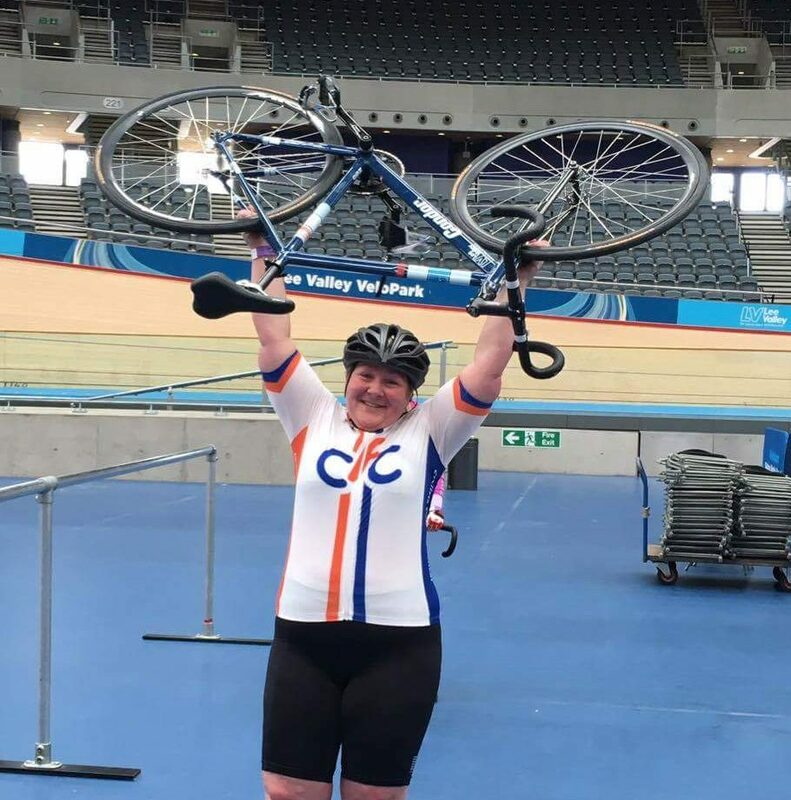 And I’m pretty happy to have made my own history, track cycling at two Olympic venues in the same city – just like Bradley Wiggins, Victoria Pendleton, and many other cyclists.